In case you don't yet know this, I am apparently the only person on the planet that does birthdays properly. Properly means BIG celebrating, making an entire season out of it, telling everyone on the planet (I'm getting better about this as I grow older), and generally being super stinkin' excited! Kohl's sent us a coupon for 20% off $100 purchase or more. We went during the special sale times (early bird on Saturday) to get the cheapest prices AND got $30 Kohl's cash off a future purchase. Oh, and did I forget to mention it was tax-free weekend in NC, which means we paid no taxes for clothes? Woot! Group all that together and we scored big! All that to say, Saturday turned into a "Treat Yo'self Day" (if you don't watch Parks & Rec, you need to. Now. Or Yesterday. Get on it!). And after we came home, Hubby suddenly became deathly ill. (Okay, not really, but he's been sick all weekend, WITH a fever, and it stinks.) CC missed church yesterday, he missed our first AMAZING and God-honoring baptism service after church for those with special needs (An entire post in and of itself), AND he's home sick today. AND he's missing my birthday lunch with my work guys (aka our friends). Sadness. Friends, please pray he gets well quickly and I stay well. This is a crazy kind of week and I need us both to be well. On top of the regular week going on, the ministry's Girls' Night Out event is Thursday, which I still have much to prepare for and the birthday weekend is coming up. Lots going on. Lots to be well for. No time for dying of feverish illnesses. Now on to the happy news... 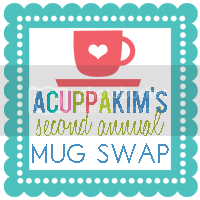 If you are crazy and STILL have not yet signed up for CuppaKim's annual mug swap, what on Earth are you waiting for?! It's going to be AMAZING! Join us! Poor cc, that sounds so disappointing to miss!!! How awesome that you guys need more clothes and even more awesome that you got such steals at kohls. I think I need a trip there ASAP!!!! Yay for needing to go shopping and scoring some awesome deals!!! So sorry to hear about your hubby. Poor guy! Definitely praying he feels relief soon and is 100% better ASAP!! !